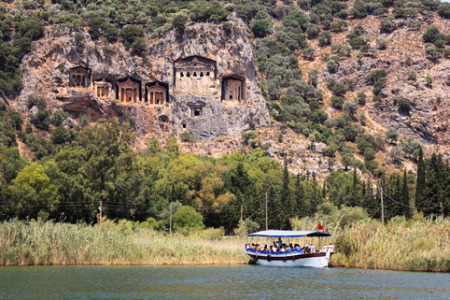 Dalyan holidays take to the Dalaman region of south west Turkey. Located in a protected area where over-development is not permitted, this attractive resort offers levels of peace and serenity that are often hard to find. Lying on a river which opens into the Mediterranean Sea, this charming town, surrounded by natural beauty, has much to offer. It attracts families and couple of all ages, as well as nature lovers who come to see the breeding ground of the loggerhead turtles and the huge variety of birds. With low cost airlines flying from many regional airports, travel to Dalaman has never been cheaper. With transfers of half an hour, you can be relaxing by the pool in next to no time. The holiday season begins in April and continus until the end of October. The mercury rises well into the thirties at the height of the summer. Loads to see and do. You'll find that both accommodation and service is excellent and you are assured of a warm welcome. Restaurants cater for all tastes from traditional Turkish to international cuisine. If you are new to Turkish cuisine, order Meze, the equivalent of Spanish tapas, and you'll be given delicate portions of a variety of dishes. There are plenty of shops in the resort but if you enjoy haggling over prices, do visit the Saturday market where you'll find bargains galore. Nightlife here is fairly low key and geared towards families and couples. All in all, a cheap Dalyan holiday offers all you need for a relaxing break in the sun. Dalyan offers many recreational facilities and tourist attractions. River trips to the stunning beaches in the area include Iztuzu Beach where the turtles lay their eggs. Those interested in history should visit the famous Rock Tombs of Kaunos where excavations of a city, built an amazing five thousand years ago, are being unearthed. Dalyan is also famous for its thermal springs said to have health giving properties. Many visitors enjoy the mud baths which then dries on the skin. It is a so-called anti-ageing treatment, but don't be disappointed if your laughter lines remain. Search & compare Dalyan holidays today. If you fancy a Dalyan holiday, but find the task of scouring the internet for the cheapest option a little daunting, use our simple search facility that will quickly find you the holiday that gives you the best deal. As a price comparison site we bring you offers from over thirty travel companies, including some of the market leaders, who are all competing for your custom. This competition inevitably leads to great bargain holidays. As the very best offers change daily, don't delay, ring and book today. Check out our Dalyan holidays 2014.